American DJ P36 LED system DJParts - All Variety of Parts that DJ Needs. 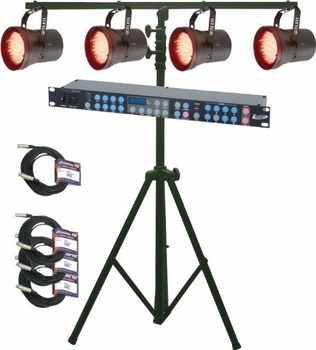 The American DJ P36 LED System is a handy compilation of lighting equipment from American DJ that includes four of American DJ's P36 LED PAR cans, their DMX Duo recorder/controller, and an LTS-6 tripod stand. The lighting package also comes with one 25' cable and three 10' cables.American DJ's P36 LED PAR (parabolic aluminized reflector) cans are LED pin spot lights that create rich palates of color using RGB (red, green, blue) color mixing.